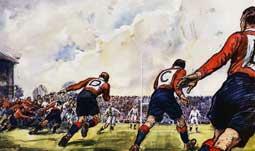 England and Wales have played each other at rugby union since 1881. A total of 127 matches have been played, with England having won 58 times, Wales having won 57 times and twelve matches having been drawn. There is a considerable rivalry between the sides due to the proximity of the two nations and the history between them. In the World Cup, the teams have played on three occasions, 1987, 2003 and 2015 with Wales winning twice and England winning once; there have been no draws. In these games, England have scored 56 points, and Wales 61. In the Home Nations Championship (1883-1909 and 1932-1939), England played Wales on 33 occasions, England winning 13, Wales 16 and four matches have been drawn. In these games, England have scored points, and Wales . In the Five Nations (1910-1931 and 1947-1999), England played Wales on 70 occasions, England winning 30, Wales 32 and eight matches have been drawn. In these games, England have scored points, and Wales . In the Six Nations (2000–present), England have played Wales on 16 occasions, England winning ten, Wales six; there have been no draws. In these games, England have scored 426 points, and Wales 286. In other test matches, England have played Wales on five occasions, England winning four, Wales one with none drawn. Overall, England have scored 137 points, and Wales 52.